For many years local recreational (Rec) leagues for women have flourished in Allegany County. Sponsored by local businesses, civic groups, and taverns teams have competed in such sports as bowling, softball, table shuffleboard (the Frostburg Women's and Allegany County Women's Shuffleboard Leagues), and even horse-shoes. 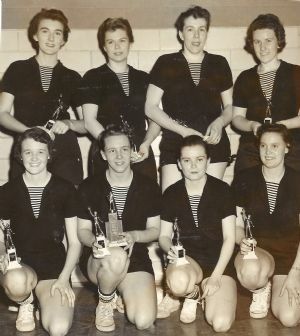 During the 1950s and 1960s, women's basketball was also very active. The photograph above and caption below appeared in the Cumberland newspaper. Although there was no date on the original newspaper clipping, an article excerpt on the back referencing actress/celebrity Zsa Zsa Gabor, her fiancé at the time (Hal Hayes), and Vice-President Richard Nixon places the date sometime between 1959-1960. "REC TOURNEY CHAMPIONS -Ed McGee's Service Station cagers won the championship in the annual Women's REC Basketball Tournament last night by defeating the Cumberland Cement and Supply Company sextet in the finals at Carver School gym by the score 47-45 in an overtime battle. It was the third meeting of the teams in the tourney and the second time the teams were required to play an extra period. McGee's won five and lost one in the double elimination tourney, while Cumberland Cement and Supply Company won four and lost two. McGee's squad pictured above, left to right: FRONT ROW - Judy McKenty, Pat Thompson, Jeanne Hale, and Beck Jones. BACK ROW - Pat Meeks, Lucille Aaron, Donna Decker and Cathy McKay."